Most homes probably have a whatnot drawer. While other drawers may be neatly categorized and organized as to their contents such as clothing or office supplies, the whatnot drawer is where everything else goes. The more years that go by, the greater the collection in the whatnot drawer. Our whatnot drawer recently wouldn’t open. I fixed this by removing an eyeglass case that had become wedged between the drawer and the frame. While I was doing this, I decided to dump the contents of the drawer onto a table and to determine what to leave, move, or purge. I discovered that the drawer contained a small collection of like items which I’ll call scenic slide viewers. I don’t yet know their official name. One of mine has “Optimo Videoscope” in raised, molded letters around the plastic lens. Prior to every tourist including children having cell phones with cameras, gift shops at tourist sites sold these scenic slide viewers to customers wanting to have a snapshot of the place they visited. Usually, the scenic slide viewer came with a key chain. 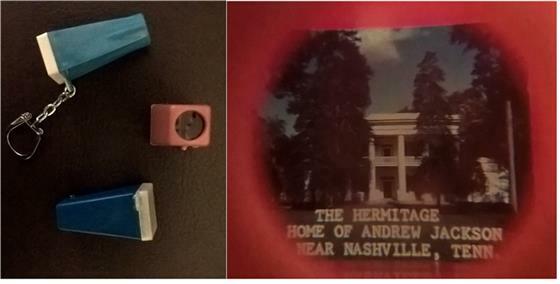 · Fort Nashborough model at the children’s museum in Nashville. Oh, I remember that this and the Hermitage viewer were from a fourth grade field trip to the state capital and included a class photo with the governor on the capitol steps. · The U.S.S. Arizona memorial at Pearl Harbor. I think that a relative gave me this one. · Fields of the Woods park at Murphy, NC. I know that's around the house somewhere, but isn't in this whatnot drawer. We have multiple whatnot drawers. The scenic slide viewers were classic low-tech ways of taking photos home to preserve memories. The popularity of having photos, along with the limitations and awkwardness of the early methods, led to the development of cell phones with cameras. So, don’t laugh too long at scenic slide viewers and their fans. All modern technology has its roots in something less sophisticated! I am curious how many other scenic slide scenes were depicted. If you have a viewer, please send me an e-mail at scenicslideviewer@yahoo.com (trying to keep the responses separate from regular e-mail). I’ll post some of the responses as updates to this article. If you can take a photo of the scene inside the viewer and send it, I’ll include in a photo gallery with the article. Please don’t send any of those scenes which depicted models. That thought reminds me of a Beverly Hillbillies episode where Mr. Drysdale and a banker friend were sharing slide viewers with depictions of money and gold, and saying “vah-vah-voom” after seeing each image. If you were a factory worker or route salesman or gift shop owner involved with scenic slide viewers, please e-mail your memories to me. That will add to this compendium of all things known about scenic slide viewers.